I seem to have a lot of 5 by 8 grids here and there in the Lesson Plan Forms section and I decided to place them all on a page by themselves. If you are new to making lesson plans, please visit this page: Homeschool Planning Help to learn how to make very simple plans from different types of books. 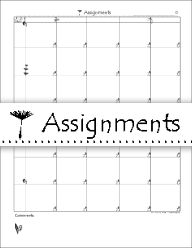 Weekly Planner This is the basic weekly homeschool planner which has 5 columns and 8 rows. The header space has a place to write the child's name, grade and year. The blocks are approximately 1" tall x 1.25" wide. A typeable version - This file does not save what you type. 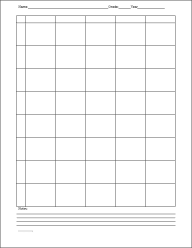 To Use: Type in the fields and Print. You might have to click in the fields more than once before you can type. The blocks are approximately 1" tall x 1 3/8 " wide, which is slightly bigger than the Plain and Basic. The Colonial Homeschool Planner set has a large variety, including household planners and calendars. I know of at least one person who knows that I have a snowman lesson planner. Now that I have pulled it out of hiding, everyone will know about it. There are two as you can see by the two links above. One has a tiny list along the right edge. The blocks are approximately 1 1/8 " tall. Width listed below. 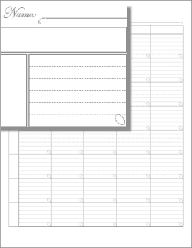 I have two 5x8 grids in the Papyrus Planner. The block sizes of the two are identical, so what is the difference between the two? The grid is raised in the second file to make more room at the bottom for comments. The second file printed a little lighter when I test printed it. The marble planner is what I made with a paint program some time after I learned how to use the fill in a masked area. Isn't it pretty? This is 5x8 because it is for 5 days and it has 8 rows. 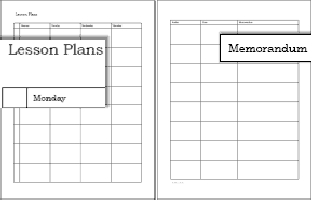 In addition to the 5x8 lesson plan grid, there are two more columns, labeled "Lists" and "Memorandum." The lesson plan blocks are approximately 1" tall x just over 1.5" wide. 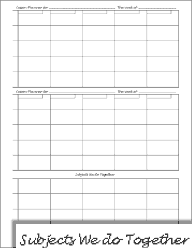 Lesson Plans - 2 Pages (Days Labeled) This planner requires two sheets of paper to print. One side has 4 columns and 8 rows.. presumably for Monday through Thursday. The second page has 3 columns and 8 rows. One column for Friday, one columns for lists, and one wide column for anything you feel like using it for. The planner is completely not ruled and simply has the header, Lesson Plans. The 2-children planner has 3 sections. The two top sections can be used for subjects that the two children do separately and the bottom section can be used for the subjects that the children do together. This planner is 5x8 because there are 5 columns and 5 rows for each child plus 3 "together" rows, which makes 8 rows. The blocks are small - 5/8 " tall x a little over 1 1/4" wide.